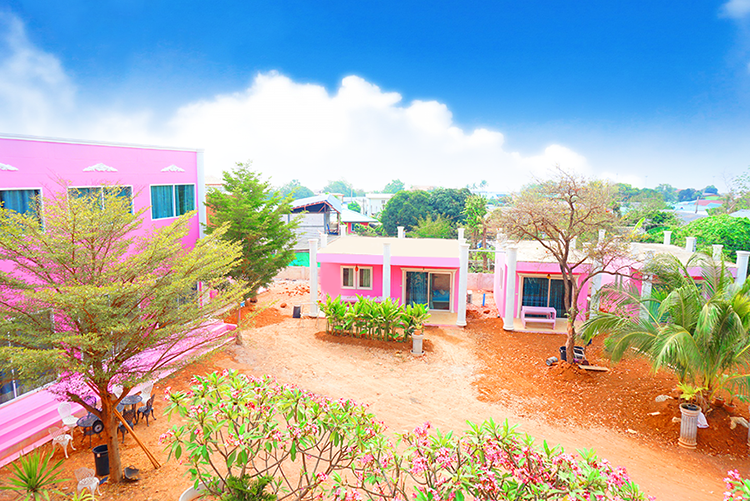 Baanpoungchompuu Resort Koh Larn is a low cost resort on Koh Larn, provides clean room with complete facilities among a nice atmosphere that quiet and pleasant. We also provide barbecue and grilling equipment for a group that would like to enjoy their seafood barbecue night. In our “Pink Concept”, all of our rooms and decoration are mostly pink, as a result, it looks so sweet. Baanpoungchompuu Resort Koh Larn is not beside a beach. It is located on the way go to Thong Lang beach and only 500 metres from Na Baan pier. The nearest beach is Ta Wan beach which is 1 kilometres away and takes only 5 minutes to get there. Baanpoungchompuu Resort Koh Larn offers several types of rooms to accommodate a wide range of party sizes and guest desires. There are room for 2 persons, bungalow for 4 persons, rooms for 4 persons (2 bedrooms), and bungalow for 7 persons. We dare say that our room rates are not expensive. It is so affordable. Compare to other resorts on Koh Larn, our Baanpoungchompuu Resort Koh Larn is a budget resort and has good quality room. All types of rooms include breakfast and transfer service from Na Baan pier to our resort. In addition, if you would like to have seafood barbecue grilling, full set of grilling equipment are also provided for free.